Comb binding have round plastic spines with 21 rings (for A4 measure) and a hole puncher that makes rectangular holes. Comb binding have round plastic spines with 21 rings (for A4 measure) and a hole puncher that makes rectangular holes. Comb binding is some of the time alluded to as plastic comb binding or spiral comb binding. With this bind finishing, the book lies flat but can’t be opened 360 degrees. 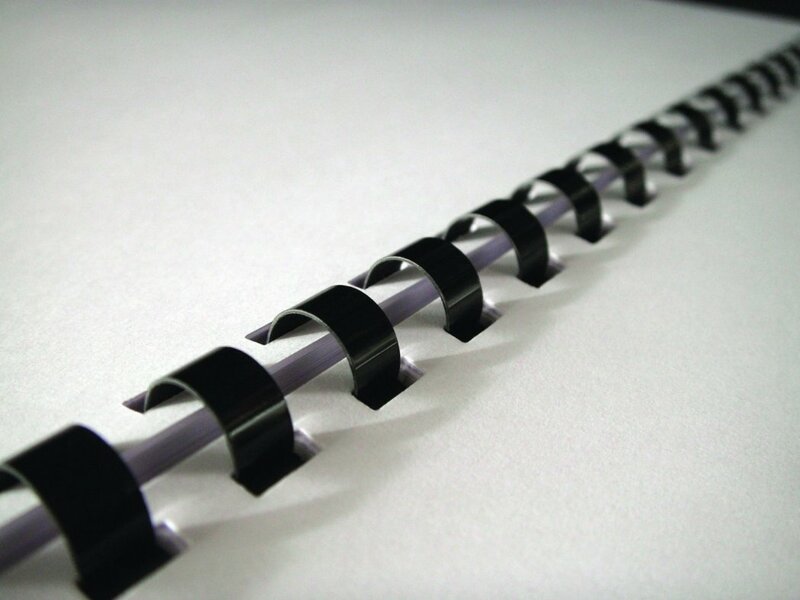 For a book that can be opened like the above, will require a spine that does not have an obstructive body, for example, a coil binding, will suit. To bind a bundle of paper document, the client initially punches holes in the paper with a particular paper puncher. Pages must be punched all in one shot with these machines so that it is neat and aligned. On the off chance that hard covers or plastic covers are used, they should be punched too. In mass applications, a paper drilling machine might be utilized. At that point the client picks a spine measure that will fit the thickness. Standard sizes are 4.8 mm (3⁄16 in) (for 16 sheets of 20# paper) up to 51 mm (2 in) (for 425 sheets). Spine lengths are by and large 280 mm (11 in) to coordinate the length of letter-measure paper. The rings on the spine open and fit into the hole of that documents. at that point release the spines on the comb bind so that it rests against the core of the spine, hence bringing about a finishing that is neat. The stash of paper document can then be opened again to make changes to the book.